The word, hash, does not inspire me. It makes me wonder why I chose to make this recipe from Anne Burrell. I decided to look up the definition and see is there is a reason for my negativity to this word. Just look at this. A dish of chopped meat, potatoes, and sometimes vegetables, usually browned. To chop into pieces; mince. To make a mess of; mangle. Perhaps the definition explains my reaction. A jumble, hodgepodge, mess......That is what it is though. I cut up a bit of this and a bit of that and ended up with a delicious mess, hash. 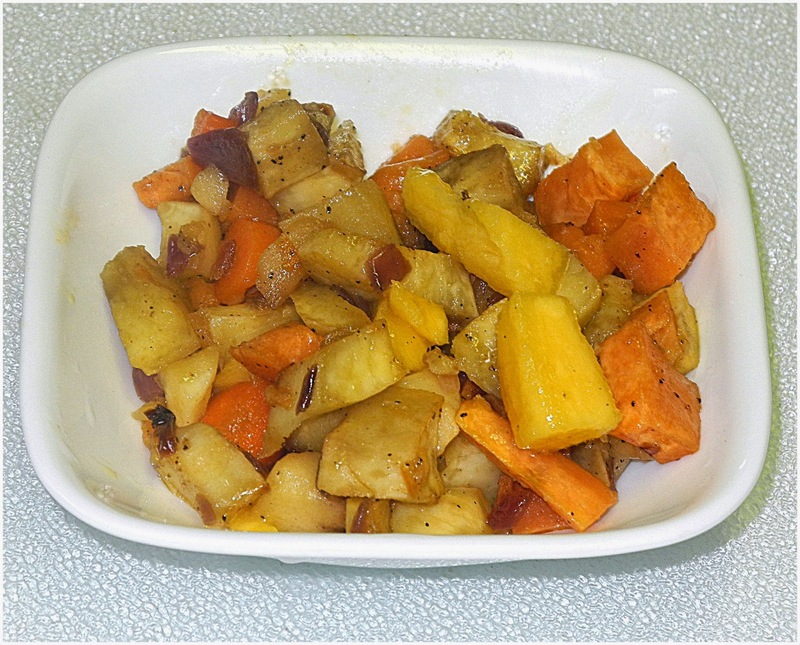 In a large bowl, add the sweet potatoes, yams and carrots and drizzle with olive oil and sprinkle with salt, to taste. Toss to coat and arrange them on a baking sheet. Roast the vegetables until they are soft but not mushy, about 10 to 15 minutes. Remove from the oven and reserve. Heat a large saute pan with olive oil. Add the onions and saute until the onions are very soft and aromatic. Add the apples and mango and saute for 3 to 4 minutes. Stir in the sweet potatoes, yams and carrots and saute until cooked through and starting to become crispy, about 7 to 8 minutes. Eat and enjoy. Since this is supposed to be a hodgepodge, feel free to add whatever veggies, you would like. I could see yellow squash fitting in nicely. I love hash, but have never tried it with mango before! Such a lovely and interesting ingredient! Thanks for linking!